What is Felony DUI in California? In California, the prosecution must prove that you actually drove a vehicle at the time of being under the influence. Driving has been defined by our courts as actual movement of the vehicle, no matter how slightly. This element is typically satisfied when the arresting officer actually observes the movement. However, it is permissible for the prosecution to use circumstantial evidence to establish that driving actually occurred. When a person drives with a BAC of 0.08 percent or higher, they are considered to be per se under the influence. This means that the prosecution only needs to prove that the driver’s BAC exceeded the statutory limit to be found guilty of DUI. “Under the influence,” however, requires a finding that (1) a person ingested alcohol or drugs, and (2) the alcohol or drugs affected the driver’s motor skills to a degree where they could not operate the vehicle with the same care and ability as a sober driver. This requires the prosecution to provide evidence of the driver’s impaired state at the time of driving. The prosecution will rely upon field sobriety tests and the officer’s observations of slurred speech, driving patterns, balance, odor of alcohol, and blood-shot/watery eyes. The third element that must be proven is that, in addition to driving under the influence, the charged person committed an illegal or neglect act. This may include speeding, running a red light, failure to use a turn signal, illegal u-turn, etc. Alternatively, the prosecution may find that you were negligent in your manner of driving. The prosecution must find that, as a result of the illegal or negligent act apart from driving under the influence, another person was injured. The injury can be very minor in nature in order for the prosecution to charge you with felony DUI. A person may also be charged with felony DUI, if it is their fourth offense within the past 10 years. A fourth offense carries mandatory jail time, enhanced penalties and fines. Typically, if all prior offenses occurred in California, the prosecution will can submit an abstract to the court establishing that all priors occurred within the past 10 years. However, for repeat offenses, some or all may have occurred outside of California, where timelines may not be clear as to establish the 10-year rule. Additionally, for out-of-state priors, other states define DUI differently than California. In some instances, the state requires fewer elements to establish a DUI conviction. They may also have different definitions of “driving” or “under the influence,” that conflict with California’s requirements. An experienced attorney may be able to challenge out-of-state prior DUI convictions. 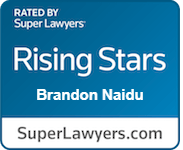 Call The Law Office of Brandon S. Naidu for your case evaluation (619) 363-4811. If you have a prior felony DUI conviction within the last 10 years, and receive a subsequent DUI charge, the prosecution will charge you with misdemeanor DUI under CVC 23152, but will then allege the existence of the prior felony DUI charge. As a result, the new DUI charge will carry felony status and you will face enhanced penalties.